Larimar is a beautiful blue gemstone that has been found in only one location on the planet: The Dominican Republic! This may be the only gemstone found in the Carribean Sea and it looks the part! The unique blue shades look very much like the blue waters of the Carribean. Typically Larimar gemstones will be patterned with luscious medium and light blues and some white. Sometimes there are patches of red or some grey or brown matrix. Occasionally Larimar will be slightly greenish. Usually the darker blues are more sought after and more valuable and whiter or greener pieces are less valuable. It has a crystalline structure that is slightly translucent and sometimes has areas that display chatoyance! Chatoyance is a shimmering luster like that seen in Tiger's Eye gemstones. Larimar is the rare, blue variety of Pectolite. It was apparently first discovered by a Priest in in Dominican Republic in 1916. He requested permission to explore further and possibly to mine the stone but his request was denied and this beautiful stone remained unknown to the rest of the world for another 58 years. In 1974 Miguel Méndez and an American Peace Corps worker named Norman Rilling rediscovered the stone on the beach in the Dominican Provence of Barahona. Natives had from time to time found the stone on the beach and believed that it came from the sea. However, it was discovered that it had actually washed downstream on the Bahoruco River. Exploring up river it was found to have originated from outcroppings on a volcanic mountain overlooking the sea. Since then Larimar has been mined, usually employing primitive methods and hand tools, by the locals. 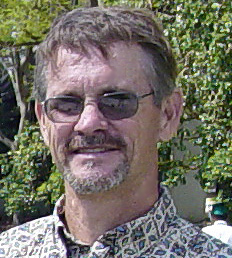 Larimar jewelry became a very popular item with tourists to the island. The new gemstone was named by Miguel Méndez by combining his daughter's name, Larissa with the Spanish word for sea (mar). Other names that have been used are Dolphin Stone, Love Stone and Atlantis Stone. 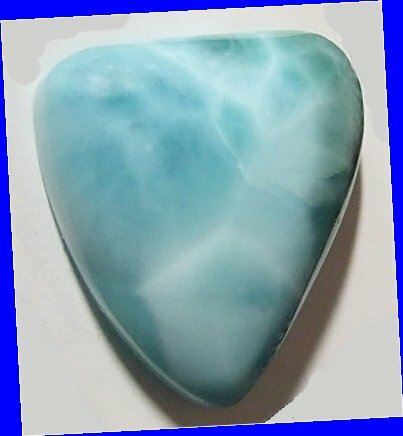 Larimar is usually cut into freeform cabochons. The rough is often somewhat crumbly and has some matrix and voids so there is a fair amount of waste when sawing and grinding. Therefore, it is often cut in free form shapes that preserve as much solid material as possible. Finished stones however, take a fine polish and their beauty is stunning. The hardness of Larimar ranges from 4 to 7 on the mohs scale with the darker blue stones usually being harder. So it is roughly the same hardness as turquoise (5-6). The blue color, not found in pectolites from any other location, is as a result of its containing Cobalt. style jewelry. Larimar gemstones may be a little too soft for everyday wear as a ring but is very popular as a pendant stone or for earrings. Larger pieces make great wire wrap subjects. Larimar offers a shade of blue unavailable in other gemstone material and it adds a tropical feel to any jewelry design.